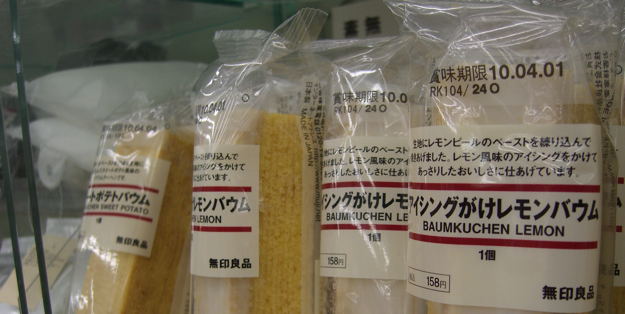 One particularly addictive item is Muji’s line of baumkuchen – known to many Americans as baum cake. Muji stores carry the full line of flavors: banana, sweet potato, pumpkin, milk tea, chocolate-iced chestnut and salt chocolate. 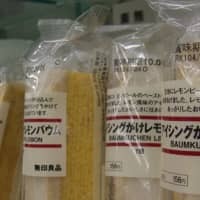 A thin cut of circular baum sells for ¥158. Smaller “stick” sizes sell for ¥105 and are available in plain, purple sweet potato and black cocoa. The two newest flavors are lemon and strawberry, both of which are topped with icing and thus are noticeably sweeter than the others. Family Marts usually offer one or two varieties, and recently the Family Mart near me has been selling the lemon flavor. It’s been two weeks since I discovered this, and I’m averaging 2.5 baums a week. The non-iced flavors are all very subtly sweet, perfect for the Japanese palate. 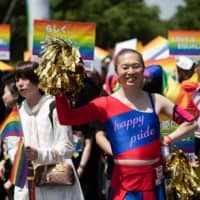 This may explain the baum-cake madness that can be witnessed outside of Nenrinya cake shops – customers regularly line up for hours in lines that extend over 1 km to buy cuts of gourmet baumkuchen for souvenirs. A single “ridge” of baum runs ¥1,239. Even if you don’t stand in line, it’s always fun to watch the baumkuchen cook on rotisseries in the windows of stores.